Her Excellency Sheikha Lubna Bint Khalid Al Qasimi, Minister of International Cooperation and Development, President of Zayed University, asserted, in a speech addressing Zayed University students during the “Second Think Zayed Women Leadership Forum at Zayed University,” that the invaluable support of the UAE’s visionary leaders, and their continuous encouragement to women has greatly participated in the rise of women’s leadership roles across the nation. Her Excellency added that Emirati women today have moved forward efficiently and effectively in the nation-building process, in line with the government’s strategy and ambitious vision for a better future. The event, which was held under Her Excellency’s patronage at Zayed University Convention Center on Dubai Campus, and under the theme, “Empowerment of Women: Women Who Broke the Glass Ceiling”, came as part of the UAE's 43rd National Day celebrations. 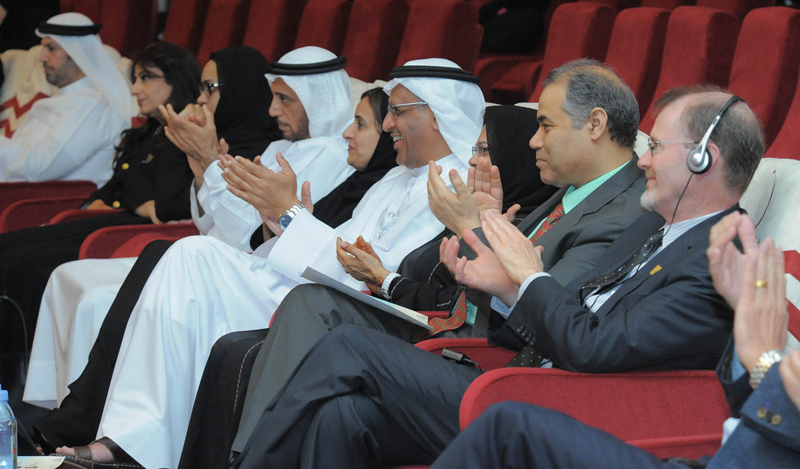 The forum was attended by His Excellency Prof. Reyadh AlMehaideb, Vice President of Zayed University, His Excellency Major General/ Mohammed Ahmed Al Marri Director of General Directorate of Residency and Foreigners Affairs-Dubai, His Excellency Dhirar Bulhol, Director General of ‘Watani’ program, Her Excellency Afra Al Basti, Director General of Dubai Foundation for Women and Children, and member of the National Council; Mrs. Hala Kazim, Social Consultant, and Zayed University students, graduates, faculty and staff members. Her Excellency Sheikha Lubna indicated that support for women since the establishment of the Union had opened many doors before them leading towards empowerment, thanks to the sound directives and leadership of President His Highness Sheikh Khalifa bin Zayed Al Nahyan, Vice President and Prime Minister and Ruler of Dubai His Highness Sheikh Mohammed bin Rashid Al Maktoum, Their Highnesses Supreme Council Members and Rulers of Emirates and His Highness General Sheikh Mohamed bin Zayed Al Nahyan, Crown Prince of Abu Dhabi and Deputy Supreme Commander of the UAE Armed Forces, as several initiatives have been launched to support women empowerment in different fields. 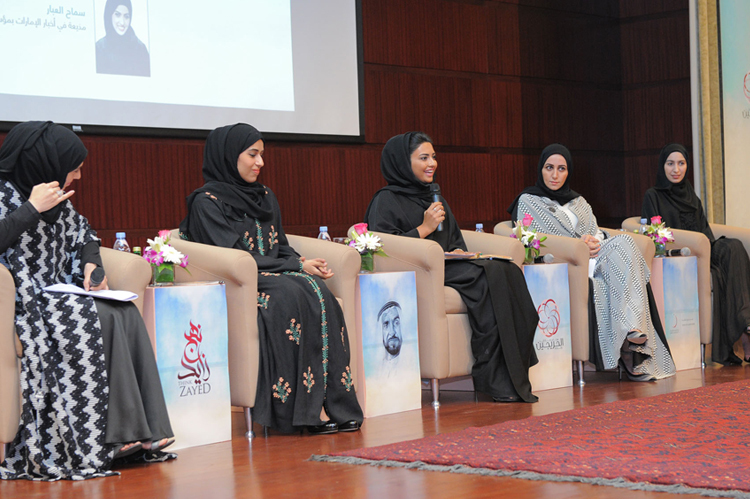 Her Excellency’s speech was followed by a panel discussion delivered by four Zayed University graduates holding senior positions in different sectors within the UAE. The panelists were Her Excellency Hessa Buhumaid, Executive Director for Government Services Sector at the Prime Minister's Office at the Ministry of Cabinet Affairs, Her Excellency Shaima Al Zarooni, the Chief Executive Officer of the International Humanitarian City, Ms. Hala Al-Gergawi, the Executive Managing Editor of “Zahrat Al-Khaleej” and the electronic magazine “Ana Zahra,” and Hanan Ahli, Project Manager of the Emirates Competitiveness Council. 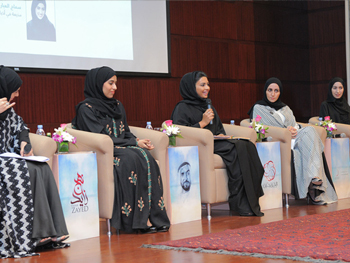 The discussion was moderated by TV presenter Samah Al Abar who currently works at Dubai TV. At the conclusion of the event, Her Excellency Sheikha Lubna and Prof. Reyadh AlMehaideb handed out appreciation awards to the panelists.